Not every student fully appreciates the power of the Sun. This compact furnace can demonstrate how hot sunlight can get. 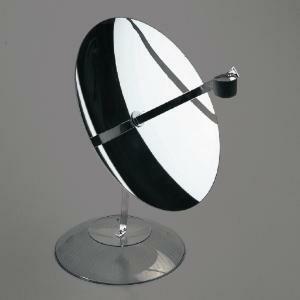 The 31cm diameter parabolic reflector concentrates sunlight on a copper cup that is painted black. In full sunlight, temperatures can reach more than 150°C. When placed in sunlight align the shadow of the receiver with the center of the parabolic mirror, or concentrate the sun’s rays directly on the copper receiver. Refocus the receiver every 10 minutes to keep the sun’s rays directly on the receiver. Ordering information: Includes: teacher’s guide.